What can I say about Mega Man that no one has ever said before? “Mega Man accurately predicted the use of drone strikes against Pakistani citizens.” “Mega Man takes his roots from an Indo-European god who would absorb other deities’ attributes after conquering them in battle.” “Mega Man sits in the tum-tum tree of life, burbling in the tulgy wood of post-modern philosophy, calling philosophical jabberwocks to examine the nature of his soul with their eyes of flame.” It turns out, I can say a lot of things. If you want something valuable, something worth saying, that might take a little extra thought. While clearly a beloved series, no one will accuse Capcom of great innovation. Consider the minute differences between the core series and Mega Man X (i.e. new end boss, upgradeable armor, and different stage select screen layout): now realize that Capcom considers those different franchises. These games epitomize the “if it ain’t broke” philosophy. With minor exceptions from game to game, if you’ve played one, you really have played them all. While Capcom ran all their old games through a meat grinder, spitting back the same ground chuck in a new package, injected with colorful dyes to make it look fresher and tastier, they also silently spit out the intestines, giblets, and other dubious parts of their creativity, crammed it into a small cartridge and sold it to us for the Game Boy. Did these guys creep out anyone else? I don’t entirely know what to make of the Game Boy. I didn’t enjoy it much when I owned one, but I only had three Mario games, Tetris, and Kirby’s Dream Land–not exactly USDA choice. On one hand, it seemed to offer an experimental system to figure out how to make better sequels, flush out series with side stories, or work more with less technical space. On the other hand, they could also simply port games from the NES, package them as portable, and rake in the dough. In the case of Mega Man, I’d put my money on the latter. For the game boy Mega Man series, Capcom phoned it in. Literally. They called in other developers to take over their flagship franchise, the character they would love, adore, and pamper like a rich, young, trophy wife (at least until Resident Evil started making eyes at them, offering more money, a younger series, and more realistic breasts…sorry, Roll.). So what exactly happens when they pimp out a favorite game? Not much, it turns out. 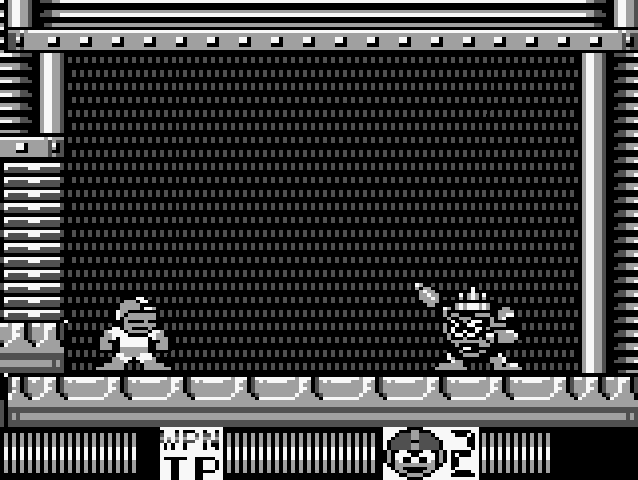 Following the formula for the Game Boy franchise, Mega Man II takes four robot masters from the NES Mega Man II, followed by four from the NES Mega Man III. For the most part, each enemy’s weakness remains the same, making boss battles about as fun as playing rock-paper-scissors with someone who believes that if he keeps picking scissors, you’ll eventually fall into his trap, pick paper, and he’ll emerge victorious (sorry, Cut Man). Psst! Rock, can you step out of the picture? You make it look less like an imposing fortress and more like an ugly SUV. After progressing through Dr. Wily’s castle…er….space station, you encounter Quint, the mysterious character who appears before you to challenge you, a la Protoman in Mega Man III. 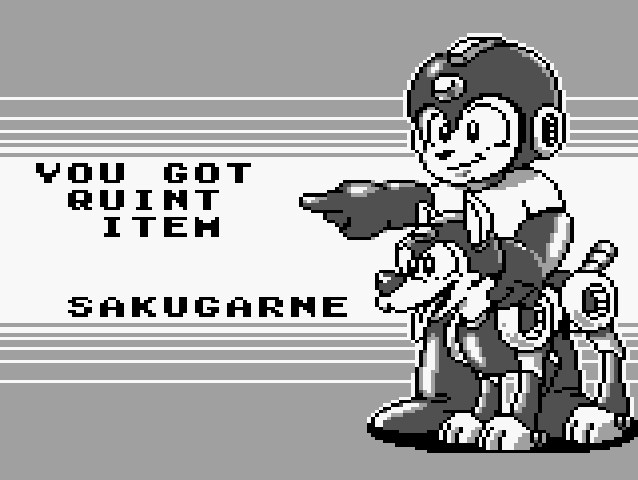 According to the additional material for the game, in the future, Dr. Wily reprogrammed Mega Man, named him Quint, and set him back in time to fight you, here, in this game. Here, the half-life of logic drops to mere seconds, like the artificial elements scientists spend thousands of dollars to create, only for them to exist for an infinitesimally small fraction of a second. Apparently, after years upon years of Mega Man pounding Dr. Wily and an army of robot masters armed with the deadliest weapons ever devised using nothing more than the blaster grafted onto his arm, Dr. Wily thought he could finally emerge victorious….by replacing the blaster with a jack hammer. I guess in the future, Mega Man really let himself go. Lost his job as defender of humanity. Maybe threw out his back. Eventually only a 2-bit road construction company would take him in, and every morning after downing a box of donuts, he throws his gut, swollen from drinking a six-pack of E-tanks every day, over the handles of the only tool he’s capable of picking up anymore, and starts ripping away at the road. I like to think Guts Man comes out of a nearby trailer every so often to supervise. Anyway, not only does the jack hammer feel slightly outclassed by an energy blaster, but after defeating Quint and adding his weapon to your stash like a serial killer claiming a trophy, you only fight one more enemy: Dr. Wily. Sorry, but even lazy, witless, beer-gut Mega Man won’t take too long to figure out what weapon to use on the final boss. And that means that the one weapon Wily thought he could use against a weapon-adaptable super-robot…also deals the most damage to Wily himself. When Capcom named him after Einstein, I didn’t realize they meant that in the sarcastic-colloquial sense. You closed your eyes! Great, now I have to take the picture again. 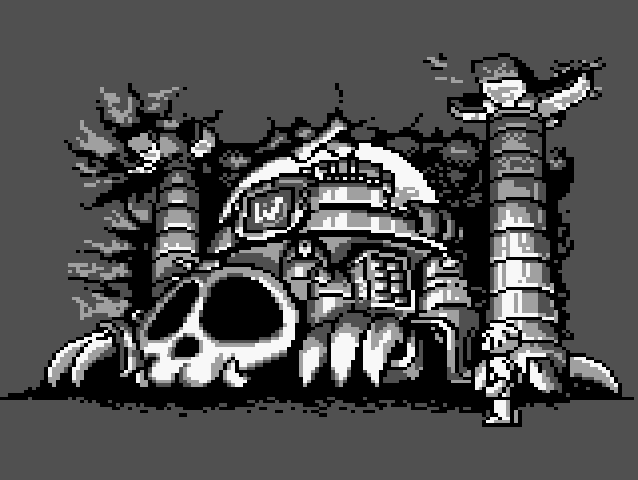 Because the Game Boy doesn’t offer much in the way of Real Estate on such a tiny screen, levels feel claustrophobic. 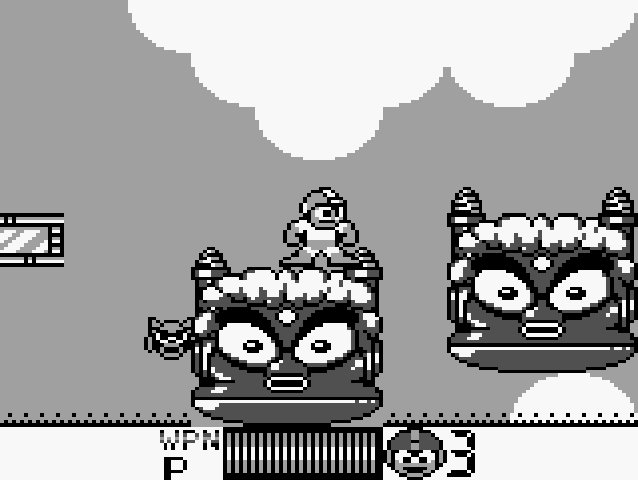 Level designs seem simpler, character sprites appear larger than they do on the NES, and as a result, less stuff can happen. A great deal of the challenge in the NES games required you to make snap decisions based on multiple threats attacking at once, requiring quick attacks, evasive action, or clever use of a weapon. Nope! Not here. I shot through the game in less than forty minutes on my first play-through. The game didn’t label which teleporters took you to the last four robot masters…that kinda added some challenge. Also, your weapons don’t refill between stages at that point. But really, I think this game shows Dr. Wily’s age. No longer full of fiery hatred towards Dr. Light and Mega Man, he steals robots and attacks humanity just to go through the motions because he doesn’t know what else to do. Really, if you think about it that way, Mega Man II for the Game Boy, rather than presenting a fun and interesting challenge, merely provides a scathing indictment of our prison system and their failure to rehabilitate offenders. And I bet that no one has ever said that about Mega Man before. 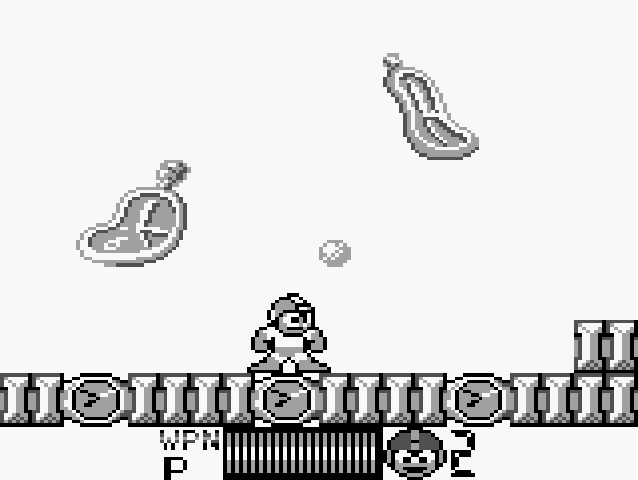 This entry was posted in Game Boy, Mega Man / Rock Man and tagged game boy, Mega Man. Bookmark the permalink.